RECIPE: Marmalade Cake – Celebrating winning GOLD at the World Marmalade Awards. Select a good quality marmalade or ideally make your own for this cake. 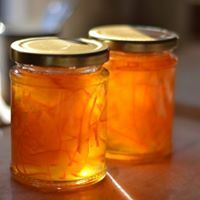 Even though the Seville season has drawn to a close this year, there is no reason that you cannot make a ‘three fruit marmalade’ or even a lemon and lime variety. This is a great preserve to begin with as the quantity of lemons ensures that a great set is easily achieved due to the high levels of pectin. 20 cm (8 inch round) cake tin greased and lined with baking parchment. Preheat your conventional oven to 150 C or gas mark 2 or place a grid shelf on the floor of your simmering oven. In a mixing bowl cream the butter and sugar together until pale and fluffy. Gradually add the eggs with a heaped tablespoon of flour with each addition and mix well. Add the marmalade and combine with the cake mixture so that it is evenly distributed. Spoon carefully into the prepared lined tin. Bake in a conventional oven for approximately 1 hours. Bake for 1 hour 15 minutes in the baking oven or in a cake baker in a 2-oven AGA or until cooked through when tested with a skewer. Once your cake is done, leave in the tin but place on a cooling rack until it is completely cold. Then remove all of the baking parchment and store in an airtight tin.